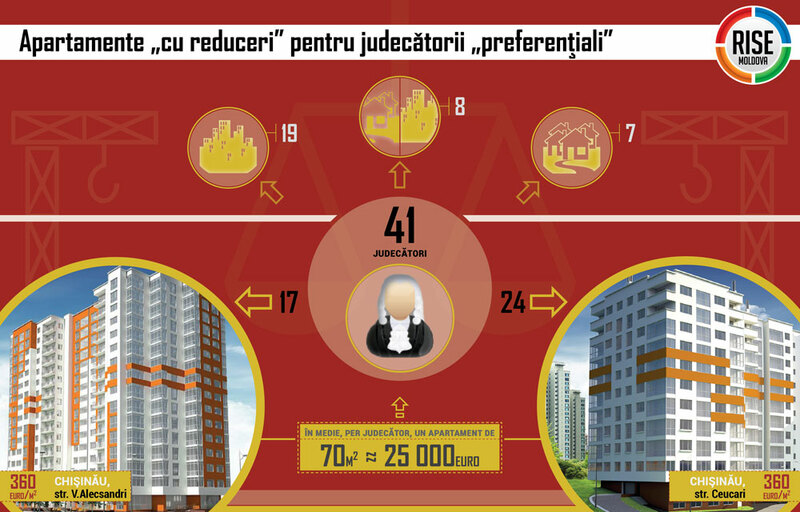 In Chisinau, judicial robes translate to “cheap apartments.” The bargain is due to the Chișinău City Hall that, despite having been deprived of many plots of land as a result of questionable court judgments, has assigned two parcels worth more than five million lei (US$ 252,000) for the use of the Superior Council of Magistracy (SCM). It appears that 41 judges will nestle in the five blocks under construction; most of them have at least one other dwelling. In March of 2013, the municipal council awarded a plot on Vasile Alecsandri Street in the city’s historic district to the SCM, along with another one on Ceucari Street in the neighboring district of Râșcani, where the construction firm Basconslux SRL is building the five blocks of flats (Details, HERE). The project is to include 133 dwellings, nearly half of which will go to employees of the judicial system including 41 judges. Basconslux is advertising the flats to the general public at about € 43,000, while judges will pay on average about € 25,000. The discount is because the SCM has provided the land. Victor Micu, CSM President: There have been many applicants but apartments have not been allocated to all of them. Account was taken of those who have a share in their parents’ apartment but in reality it is not their apartment and if they have their own families, they of course get to benefit. We don’t have judges living on the street, everyone lives somewhere. Reporters from RISE were unable to contact the judge, but spoke with her mother. Ecaterina Bumbu, Oxana Robu’s mother: She lives with me, it’s my house. I bought this one [the house in which she lives] but it was damaged and I built another house. The house is new, it’s been built for… it’s not finished yet. I’m her mother and the house is registered in my name. Stelian Teleucă: When I requested an apartment I didn’t have living space and therefore I met the conditions for this apartment “offer”. I still do not have living space. I noted in my income declaration that I have also taken a loan of 300,000 lei (US$ 15,000) for a period of 25 years. As to the sources for the payment of the loan installments, I will declare all the information in the asset declaration. From 1995 to 2009, the Law on the Status of Judges required local authorities to provide free housing to judges. Some of the judges selected by the SCM for the low-priced apartments have already received such free housing from City Hall. In May 2008, Radu Ţurcanu, deputy chief judge of the Botanica District Court, won a ruling from the Chişinău Court of Appeal requiring the city to provide him housing. Two years later, City Hall assigned him a three-room apartment on Traian Boulevard. In the judges’ block located on Vasile Alecsandri Street, Judge Turcanu will own an 87-square-meter apartment. Judge Sergiu Daguţa from the Centru District Court of Chișinău acquired an apartment in the same way. As a result of March 2014 decision, the CMC gave him a two-room apartment on P. Zadnipru Street. Daguţa also co-owns an apartment of 42 square meters on M. Costin Street in Chişinău, and in 2016 he will get a 67-square-meter apartment on Ceucari Street. The judges did not always wait patiently for the courts to rule. In April 2013, nearly a year after the Chişinău Court of Appeal required the CMC to provide housing to Judge Palanciuc, her bailiff Igor Doroftei seized 100 square meters of a house near the Ministry of Labor, Social Protection and Family which is also on Vasile Alecsandri Street. Although the house was under the control of the State Tax Inspectorate and owned by the Republic of Moldova, both the Râşcani District Court and the Chişinău Court of Appeal allowed the seizure to stand for a year. Elena Ienache, Acting Chief of the Housing Division of the General Housing and Land Organization Division of the CMC: Judges apply seizure when finding a free address based on a judgment they have. In each praetor’s office, there are about three or four thousand persons from the socially vulnerable layers who need improvement of their living conditions. If judges do not find those free spaces before the City Hall, then we provide them to the vulnerable layers. Mihail Buruian: Buruian Comerț SRL was opened by my family but its activities have been suspended since about 2011 and it’s not active. Carfina was opened by my son together with some colleagues of his but it is not active either. This business didn’t work out for them and they gave it up right then. Victor Micu, SCM President: It is supposed to be for those judges who do not work in Chișinău. We have announced to all district court chief judges about this land. We will set up a commission and we will see who deserves and who doesn’t. Even if a judge has been in the system for one year while a court clerk has been working for 10 years in the system then it will be the court clerk who gets to benefit. Everything will be transparent. Ion Carpov, Head of the General Division for Architecture, Urbanism and Land Relations of the CMC: The motivation (of the SCM) is that whatever is required is done for the system staff and will belong to them […] How many land plots (judges) need, I don’t know, it’s not in my competence. When the request comes to us, we examine it and see what the proposals could be. But whether they need more land, it’s not me who establishes this. They may endlessly request land.